The Sri Yantra, or Yantra of Creation, has been known in the Hindu and Buddhist traditions and since the earliest Vedic times as the most powerful and beautiful of all yantras (geometric mandalas known as power diagrams). It represents the timeless creative principle of the universe, the continuous unfoldment of all realms of creation from the central source, and with that mindfulness, it is used as an object of meditation. The central point, called bindu, represents unity and the transcendental source of creation. The opposing sets of triangles represent the male and female principles forming the essence of creation, themselves being recognized as expressions of the polarity inherent in the creative force of the bindu. The surrounding geometries represent the realms of creation, entirely supported by the creative process, and all of which would have no reality whatsoever without the transcendental source. 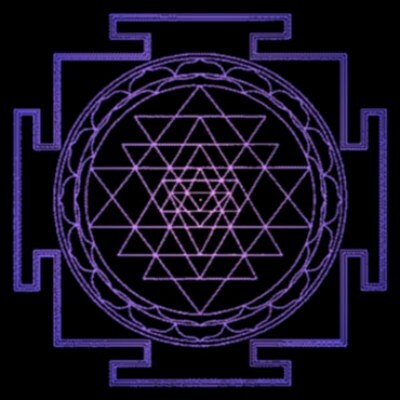 Meditated upon in this way, the Sri Yantra is a visual expression of Om (the mantric seed-syllable of creation), and represents, in its limited geometric way, the "ideal object of meditation", the Universal Logos. Logos is the first objective expression of Mythos into creation, and although refered to as object, it remains transcendental in its wholeness to the objective world. Om, the Word, First Cause, is the underlying creative force of everything while being fully transcendental as the Cosmic Center of Life Force, Universal Consciousness, the Cosmic Light. Om is the "shining-forth" of Vishnu, the creative polarity of Brahman (which is otherwise unknowable), and is poetically expressed in the language of Sanskrit as the Dharmakaya, the perfect embodiment of Divine Law (or Divine Will). the true Light of the Shining Ones. May it illuminate our minds.